Autologous hematopoietic stem cell transplantation (aHSCT) is a well-established treatment for hematologic malignancies such as multiple myeloma (MM) and non-Hodgkin lymphoma (NHL). 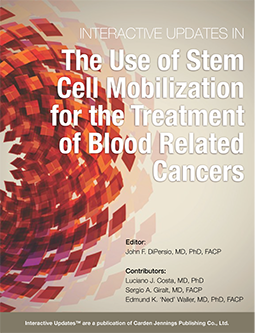 Various changes in the field over the past decade, including the frequent use of tandem aHSCT in MM, the advent of novel therapies for the treatment of MM and NHL, plus the addition of new stem cell mobilization techniques, have led to the need to reassess current stem cell mobilization strategies. This interactive educational iBook activity will provide a review of stem cell mobilization strategies and algorithms in treating patients with multiple myeloma and non-Hodgkin lymphoma, and the pharmaco-economics of engaging in stem cell mobilization to optimize patient outcomes. Learners will have the opportunity to view and respond to patient cases to help understand the relevance of current evidence to practice. If you are using a PC computer please download a PDF verison of the full iBook.